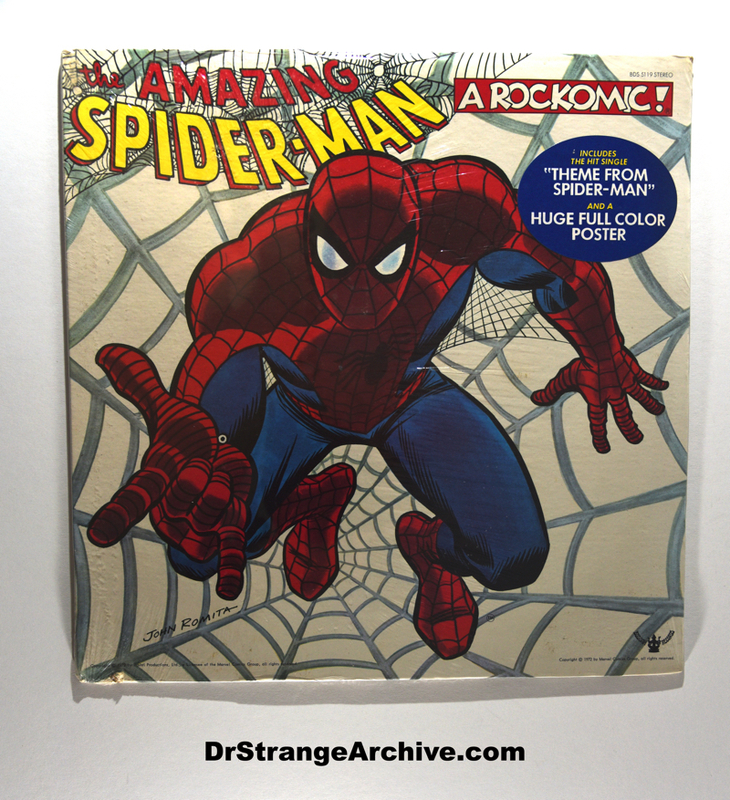 Size: 12 3/8" x 12 3/8"
Description: Back in 1972, Marvel released this album. They called it a Rockomic and it was titled From Beyond The Grave. The front features Spider-Man. The back features several Spider-man characters and Dr. Strange. John Romita does the artwork. A comic strip with Spider-Man and Dr. strange is revealed when you open it up A fold out poster is inside with the art from the cover. Ron Dante recorded this album for Buddha records. The music was released under the name The Webspinners. It was recorded at Bell Studios in NYC. The tracks include: Peters Nightmare, Theme from Spider-Man, Spider-Man Remembers, A Groove To Be Free, Spider-Man�s Dilemma, A Strange Ally, Stronger The Man, A Strange Ally (Cont�D), Goin Cross Town and From Beyond The Grave. I have been told Rene Auberjonois narrates the comic. You may recognize him as Odo from Deep Space Nine. This album was re-released in 1988 by Castle Communication PLC. This version is a picture disk with the cover art on the LP. The 1972 copy of the album in the Archive is still factory sealed in plastic.